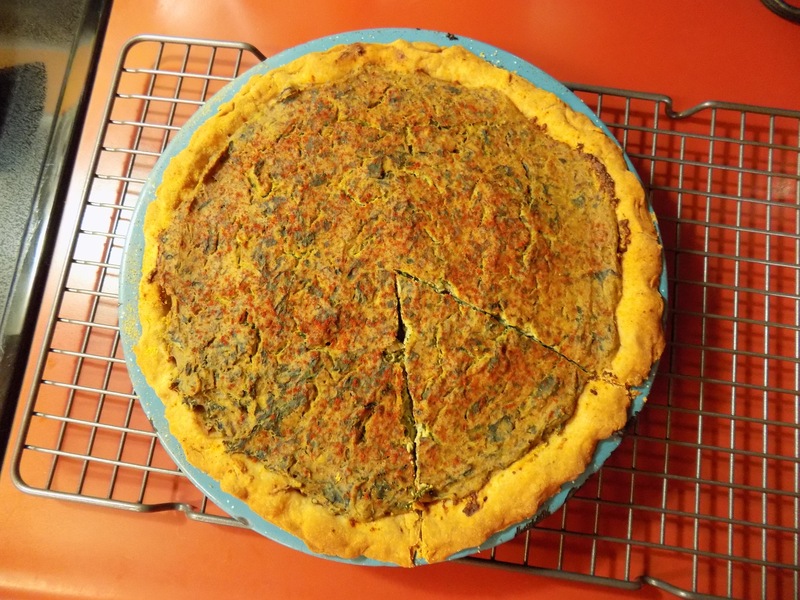 Yes, this quiche is completely free of eggs and dairy and I promise you it tastes as good as any quiche you have ever had! This is a recipe I have been making for about 30 years now and it continues to be a family favorite! Totally vegetarian and vegan, filled with tofu and healthy, tasty veggies like leafy greens and mushrooms, and really easy to make, it is sure to be one of your family favorites too! If you are new to vegetarian or vegan diet, this is a great recipe for transitioning to plant-based eating. It highlights the versatility of tofu and demonstrates that it is only bland if you let it be bland! Tofu readily soaks up any flavors you add to it, and this recipe has got flavor a-plenty! It also has one of my favorite ingredients – one that is very popular among vegetarians and vegans for its nutritional qualities and taste – nutritional yeast! This ingredient also gives it an “egg-like” color as well as adding lots of flavor! 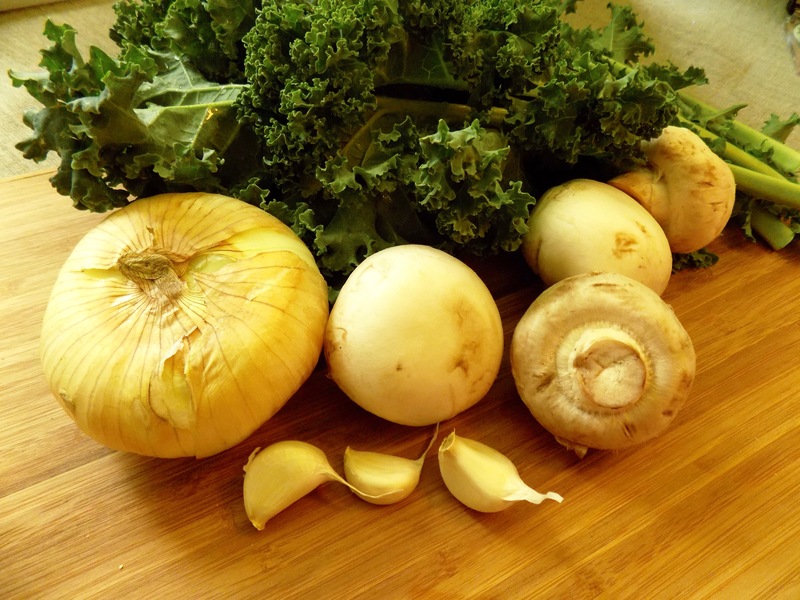 Add in some curry powder, seasoned salt, paprika, and aromatic veggies such as onion and garlic, along with nutritious mushrooms and kale, and you have an amazing combination of flavors and nutrition! You can make this part super easy by using a frozen crust purchased at the grocery store (just make sure that it does not contain lard and preferrably no hydrogenated oils). OR, if you want more of a challenge, you can make the crust yourself! Personally, I am a bit of a novice when it comes to making pie crust. But the healthier store-bought versions (whole-wheat or gluten-free, no lard) can be expensive and sometimes hard to find. Yes, they are very convenient, but I recently made my own crust and it was SO GOOD that I may never go back to the store-bought ones! The recipe I provide below is enough for two crusts, so you can put one in the freezer to use for later! 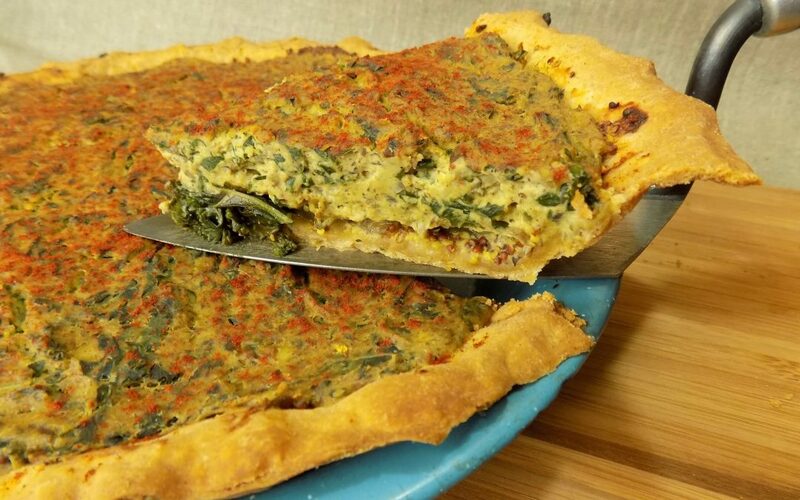 I first started making this quiche when I first went vegan in my 20s (all the way back in the stone age!). I have been making it for my family for over 20 years and everyone loves it! In fact, when my oldest son moved away from home, he asked me specifically for this recipe! It makes a mama proud to pass on recipes that you know your kids enjoy and will keep them healthy and strong! *This post contains affiliate links. 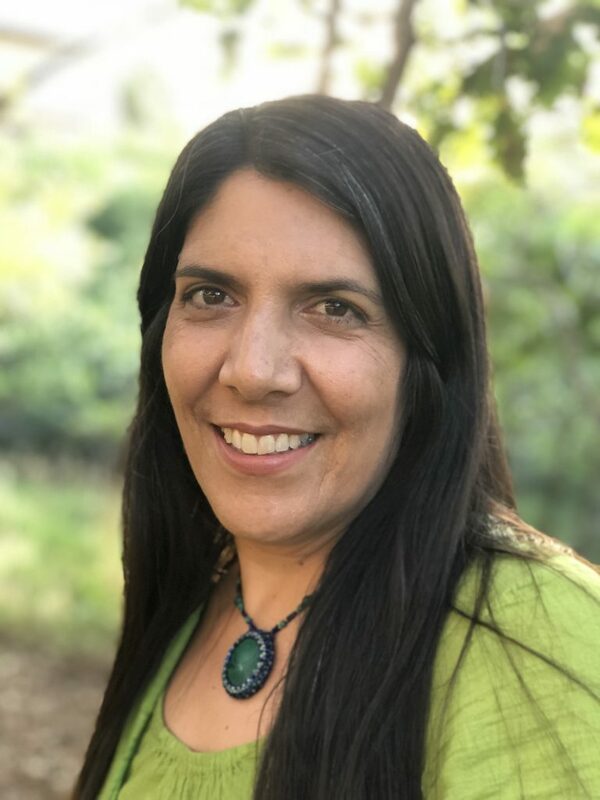 I only promote products that I use myself and am proud to share with you. I always try to use products that are organic, non GMO, and sustainably produced and/or fair trade. 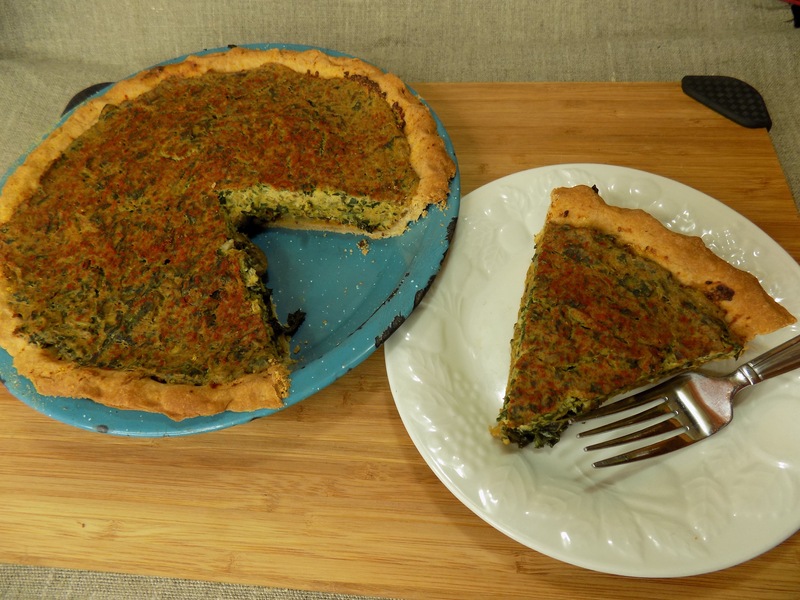 This tofu-based quiche is completely egg and dairy-free, but has all the delicious flavor you would expect from a great quiche! Place the flour and salt in a bowl to whisk, or in a food processor. Cut in the vegan butter or shortening with a pastry cutter or fork until you have a crumbly, sandy texture, or pulse briefly in the processor. Gradually add in the cold water and mix with your hands if using a bowl. If using the processor, simply process until it lumps together into a smooth ball. Divide the dough into two portions, flatten into discs, wrap in plastic wrap, and place in the refrigerator for one hour. When the dough is chilled, sprinkle some flour on a flat, clean surface, and roll it out into a circle slightly wider than your pie plate. To put it in your pie plate, gently roll it around your rolling pin and transfer it to the dish. Gently press the dough into place. If the dough goes over the edges, you can trim some off, but you will want to "pinch" around the edges to form a nice edge. Punch holes throughout the crust so it doesn't bubble up when cooked. Pre-heat your oven to 400 ℉. 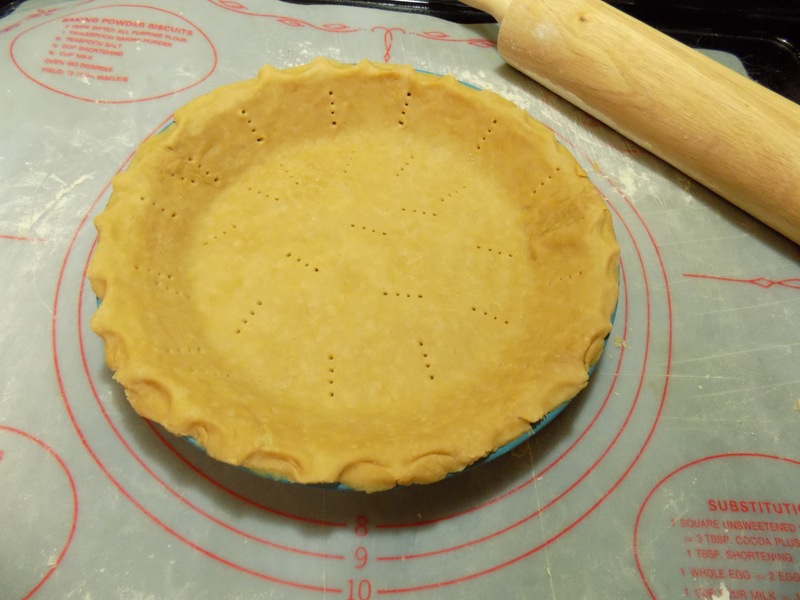 When the oven is hot, put your homemade or store-bought pie crust in for 10 minutes. After 10 minutes, remove the crust from the oven and lower the temperature to 375℉. Start by sauteing chopped onion and minced garlic in the olive oil. When the onions start to soften, add the mushrooms. When the mushrooms start to shrink, add the greens and cook until they are completely wilted. In the meantime, get out a food processor or large blender and add the tofu, 1/4 cup nutritional yeast, curry powder, Spike or seasoned salt, egg replacer, and water. Blend on high until completely smooth. Add half of the cooked veggie mixture into the processor with the tofu mixture. Blend until the veggies are incorporated into the tofu. Spread the 2 Tbs. mustard on the bottom of the crust and sprinkle with the 1 Tbs. nutritional yeast. Spread the other half of the veggie mixture on the bottom as well. Pour in the tofu mixture, spread evenly, and sprinkle with paprika. Place in the 375℉ oven for 30-40 minutes. Let cool for about 5 minutes before cutting into 6 slices. Making the crust yourself will add to the preparation time. 5-10 minutes to make the dough plus 1 hour chill time, and 5 minutes to roll out the dough. You can make the crust ahead of time and freeze it for later. This recipe will yield 2 pie crusts. Use one and freeze the other for later.